A chorus of disembodied voices harmonises from three blank screens, as three languages meld into an unintelligible creole. Straining to hear through the overlapping white noise, you realize that all three voices are communicating the same message, in tandem, in chaos. Don’t follow the wind. It is equal parts warning and welcome. Amidst the bared wires, white walls, exposed metal piping and makeshift scaffolding scattered haphazardly around the window-less room, you wonder where the wind will blow from, and when. But then you hear the metallic wheezing of the air conditioning unit above, the slightest exhale of “purified” air disturbing the stillness around you. As a general rule, people tend to spend more time at art exhibitions than the visitor information centres attached. But when the exhibition itself lies in the centre of a nuclear exclusion zone, in a land now synonymous with radiation and ghost towns, the visitor centre may be your only option. I recently visited an art-less exhibition at the Watarium Art Gallery in Tokyo’s Aoyama District. While it may seem like a self-defeating and paradoxical venture, in fact it wasn’t an exhibition at all. Instead, it was the makeshift “non-visitor centre” of the permanent exhibition Don’t Follow the Wind, curated by renowned Japanese art collective Chim↑Pom, and located close to the Fukushima Dai-ichi Nuclear Power Plant. The exhibition attracted fourteen different artists from around Japan and the world, including Chinese artist Ai Weiwei, with each artwork transported into and arranged in the exhibition space with the help of volunteer residents of towns now left uninhabited within the exclusion zone. These residents and reconstruction workers alone hold permits to re-enter the exclusion zone twice every month. Completely inaccessible to the art-viewing public, the zone now acts as a time capsule, but one subject to the same unrelenting forces of nature that have already reclaimed so much of the depopulated and abandoned land surrounding the reactors. The “non-visitor centre” itself is an assortment of scaffolding, maps, tickets and related paraphernalia, as well as “relics” from the nail-biting curating process, undertaken entirely in stark white protective suits, and accompanied by the soundtrack of a crackling Geiger counter. Venturing further, “hints” of the exhibited artworks – themselves decaying steadily, 300 kilometres away in their sealed shell – are arranged like a crime scene behind Plexiglas, the sense of distance and “exclusion” stark. The “wind” in question refers to the account of a Fukushima resident collaborating on the project, who was instructed by plant workers and officials to evacuate in the opposite direction of the wind carrying nuclear fallout material following the 11 March 2011 incident. Ignoring this advice, he evacuated his family to safety in the same direction of the wind, and away from the concentrated radiation. But why a “non-visitor centre” for an exhibition that cannot be “seen”? Well, by not seeing, we can comprehend invisibility. By not seeing, we can comprehend the dangers of an invisible threat, carried by the wind: unpredictable, and uncontrollable. Just like the radiation that threatened the Fukushima fisherman and his family, Chim ↑ Pom and the other collaborating artists invited visitors geographically and socially removed from the disastrous events to consider the dangers of an unseen adversary; the nature of “exclusion” and forced separation from “home”; and the mammoth task that lies ahead for Fukushima, and the rest of Japan, to return to a state of normality and “inclusion” and recover from the traumas of the Triple Disaster. 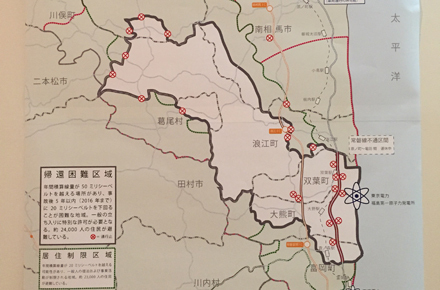 Four years after the incident, thousands of Fukushima residents have relocated for fear of radiation. They have become a floating population: some live in temporary housing; some have moved permanently to Kanto and other regions. Epitomising the cruel irony of the disaster, however, depopulated zones have become even more verdant, claiming cars, houses and other edifices of the once bustling human presence. At the same time as the exhibition, in October, Kyushu Electric Power Company was embroiled in controversy when it reactivated its Sendai reactors, just two months after a rise in volcanic activity at the Sakurajima volcano, 50 kilometres from the plant. This follows a trend since 2012, under both Democratic Party of Japan and Liberal Democratic Party administrations, of nuclear power’s steady reintegration into the Japanese electricity grid, with government projections aiming for a 20-22% share of total power generation by 2030, a mere 8-10% less than pre-Fukushima levels. Living in Japan, you realise this is a nation constantly fending off invisible and unpredictable threats. The earth itself can awaken at any time, sometimes with an unprecedented ferocity. With the wind, however, comes a threat that cannot be immediately quantified by observable, physical destruction. Radiation is insidious, and it can turn the slightest gust from a rattling air conditioner into a cold chill running down one’s spine. Energy security and the future of nuclear power in Japan remains a complex and highly contested issue. How does one of the world’s most technologically advanced nations balance its insatiable appetite for electricity with the perpetual risks associated with being located in one of the most seismically active regions of the globe? Although evacuees were instructed not to follow the wind, perhaps it’s time for another wind to rise. Rather than following radiation-laden wind of nuclear power, perhaps it’s time for a new model of energy supply to blow through Japan. All we can hope for is that the same wind from Fukushima doesn’t blow twice.